He was born in 1876, the year Custer made his last stand against the Sioux Indians and died the year after Americans landed on the moon. He was a private of Florida State Troops, and a lieutenant general of the Florida National Guard. He served on the Mexican Border, and in France, and in Belgium. He was a farmer and dealer in lumber products. He helped bring relief to Floridians suffering from the ravages of nature or of disorderly citizens. He served the Guard as its National Bureau Chief, and his state as a wartime coordinator of civil defense. He was active in civic affairs, and grew prize-winning flowers. He was Albert Hazen Blanding, Florida’s most nationally prominent Guardsmen. Albert Blanding was born in Iowa on the 9th of November, 1876, and when he was only two years old his family moved to central Florida. In Florida he grew to young manhood, attending the East Florida Seminary, today’s University of Florida. In 1895, he enlisted as a private in the Gainesville Guards, Florida State Troops. In 1899, his superior skills and abilities brought him a promotion to Captain of Florida’s 2nd Regiment, with which he was destined to serve until 1917, finishing as its commanding officer on the Mexican Border. America went to war with Germany in 1917. In the early months of conflict, Albert Blanding was one of only eight National Guard officers elevated to the rank of General by President Woodrow Wilson. At first assigned duties with the 31st Division, he was later detached to serve in France and Belgium with French and American formations. The final months of the war found him in command of a brigade in the 27th Division. The 27th fought with the British Army in France and Flanders. Blanding was in command of the 53rd Infantry Brigade when the Allied army, including the 27th Division, broke the German Army’s final defense on the Western Front, from the Hindenberg Line. In 1919, a battle-tested and experienced Albert Blanding returned home to Florida. Blanding presumed his active national service career was over. He resumed his duties with Florida’s Guard and reestablished his civilian career. But his talents as a military leader were not destined to remain unused long. Commanding a division wasn’t to be his only service in the years between the two World Wars. In 1936, he was selected by President Roosevelt to be chief of the National Guard Bureau. Between 1936 and 1940, he was instrumental in obtaining the political and financial support at the national level to obtain the equipment and training necessary to prepare the country’s National Guard for the war many were certain was coming. Blanding commanded the 31st Division during the Lousiana Army maneuvers of 1940, retiring from active service immediately afterward. He had served his state and nation for more than 40 years, but he wasn’t finished yet. With the onset of the Second World War, Blanding quietly retired in Florida, assumed duties as coordinator of the action forces of the state’s wartime civil defenses and as military advisor to the governor. He was to hold these positions until war’s end. The last 25 years of Blanding’s life were spent quietly at his home in Bartow. He continued to be active in civic organizations and was willing to speak publicly on matters important to the Guard. But his primary occupation was tending to his large flower garden. His wife was the creator of new varieties and he was the gardener, hard work to which he attributed his long and healthy life. He died in 1970 at the age of 94. 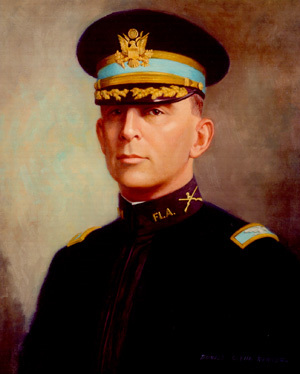 As one of the true founders of the Florida National Guard, it is appropriate that the Guard’s state training camp near Starke is named for Albert Hazen Blanding. After all, he remains Florida’s most famous Guardsman.